Last night we saw the magic of Bobby McFerrin working ‘in the moment’ with the gorgeous dancer Máire Dee and an inspired group of musicians including Kate Ellis, Robbie Harris, Emer Mayock, Úna Ní Fhlannagáin, Nick Roth, John Sweeney and Francesco Turrisi. You really had to be there to appreciate this fantastic collaboration in making music ‘in the moment’. There’s another chance to experience this amazing musical event – there are still some tickets available for tonight’s performance when Bobby will be singing, dancing and playing with a new combination of artists including Cindy Cummings – Dancer; Kate Ellis – Cello; Robbie Harris – Bodhrán; JPTrio (Ted Kelly, Jos Kelly, Paddy Hazleton) – Banjo, Button Accordion, Cajón Kit; Emer Mayock – Irish Flute; Francesco Turrisi – Piano, Accordion, Percussion. 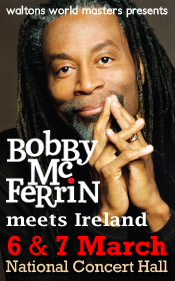 See the Waltons World Masters Bobby McFerrin Meets Ireland web page for more information.